There will be no refunds for cancellations after 4p.m. Friday, April 27. The federal government is seeking to legalize and regulate Cannabis under Bill C-45, the proposed Cannabis Act. The Act is currently before the Senate for review, and the Senate has committed to hold a third reading no later than June 7. If approved, provinces and territories have requested a few months to transition to the new framework. How will the new cannabis legislation impact your business? 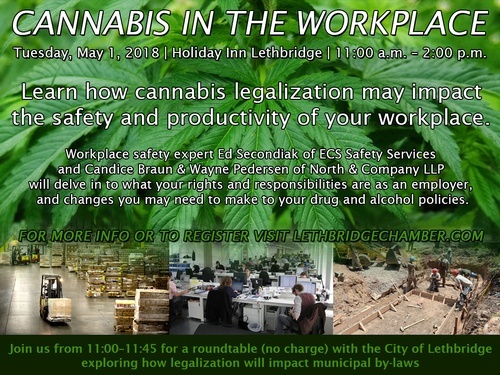 Join the Lethbridge Chamber of Commerce for the Cannabis in the Workplace Workshop from 11am - 2 pm on Tuesday, May 1 at the Holiday Inn. Representatives from the City of Lethbridge will be available for a free session from 11-11:45 am to discuss how new cannabis legislation will affect municipal bylaws. Representatives from 420 Clinic will also be on hand to answer questions. Following that will be a paid lunch session featuring presentations from Ed Secondiak, President of ECS Safety Services Ltd, Wayne Petersen and Candice Braun of North & Company LLP, and Darcy Hansen, president of HD Occupational Health Services Corporation and director of HealthyWorker. They will discuss how legalization may impact the workplace, strategies for dealing with the use of drugs/alcohol in the workplace, and the use of prescription drugs including medical cannabis in the workplace. They will also discuss what you need in a policy and what to do if you do not have a policy, and your rights and responsibilities as an employer.